Made in Space's prototype 3D printer, which is bound for the International Space Station in 2014, has passed a series of microgravity flight tests, company officials say. Image released June 19, 2013. A 3D printer bound for the International Space Station in 2014 has passed a series of key microgravity flight tests, the device's builders say. Three prototype versions of space manufacturing startup Made in Space's 3D printer showed their stuff during four airplane flights that achieved brief periods of microgravity via parabolic maneuvers, company officials announced today (June 19). "Today, we demonstrated that our 3D printers can print in microgravity," Made in Space strategic officer Mike Chen said in a statement. "Next year, we will demonstrate that they can print on the International Space Station." 3D printers use a technique called extrusion additive manufacturing to build objects layer by layer out of polymers, metals, composites and other materials. 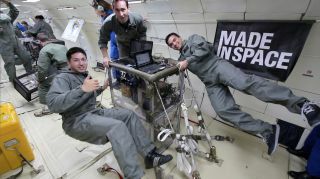 Made in Space's machine is slated to launch toward the orbiting lab in August 2014, in a collaboration with NASA's Marshall Space Flight Center called the 3D Printing in Zero G Experiment (3D Print for short). The main goal of 3D Print is to help jump-start an off-planet manufacturing capability, which proponents say could aid humanity's push out into the solar system by making living in space easier and cheaper. "The 3D printer we’re developing for the ISS is all about enabling astronauts today to be less dependent on Earth," Noah Paul-Gin, Made in Space's microgravity experiment lead, said in a statement. "The version that will arrive on the ISS next year has the capability of building an estimated 30 percent of the spare parts on the station, as well as various objects such as specialty tools and experiment upgrades." In the recent tests, which were conducted as part of NASA's Flight Opportunity Program, the 3D printer prototypes flew aboard a modified Boeing 727 operated by the Zero-G Corp. Each two-hour flight featured 32 microgravity-inducing parabolas, Made in Space officials said. Made in Space also conducted parabolic flight tests in 2011 to help guide the design of the current prototype, officials said. NASA seems bullish on 3D printing's potential. For example, the space agency also recently funded the development of a prototype 3D printer designed to make space food products out of cheap raw materials that have a long shelf life. This "3D pizza printer" could help feed astronauts on long space journeys, such as the 500-day trek to Mars and back, agency officials say.